So here it is, what do you think? Was this worth the effort? Reading Winnie-the-Pooh and some Bees to the bees at the apiary. I think most of them enjoyed it but unfortunately one objected to the story and decided to sting her through the suit… this led to a few tears but a quick recovery and a return to the hives was rewarded with some honey filled brace comb which seemed to completely erase any memory of the sting… mind you who doesn’t like fresh honey? 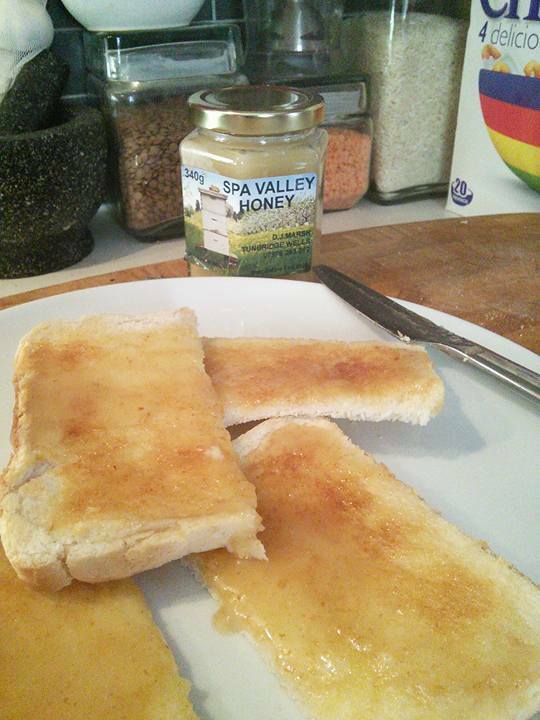 I thought that I would also take the opportunity to get a review on this years honey from an expert (she’s been eating it from the hive since she was a toddler!) and here is what she had to say…. 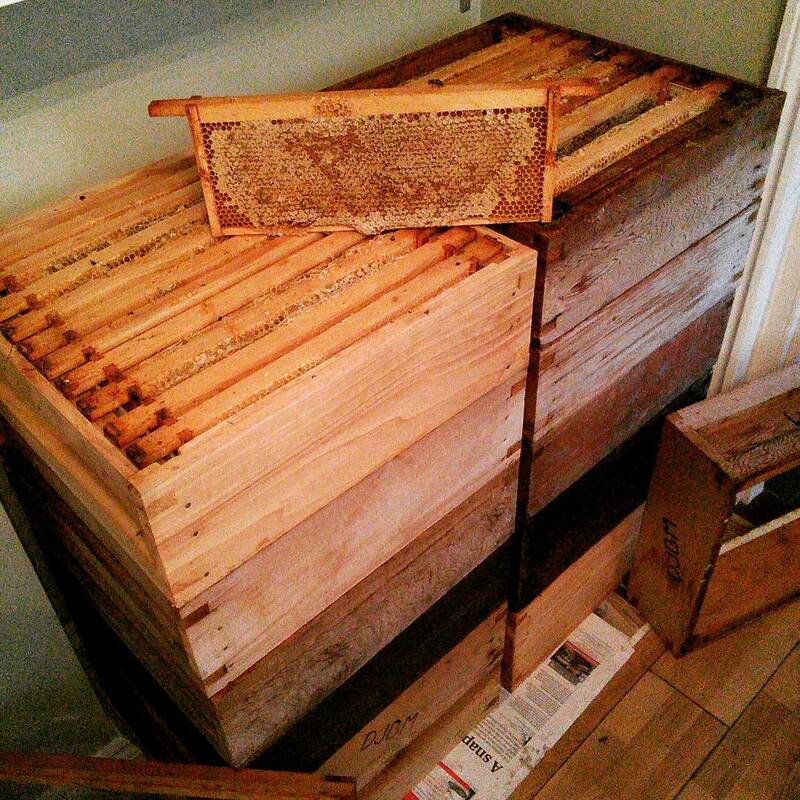 I hope you enjoy sharing my beekeeping journey with me, please feel free to comment or share. I can also be found at @danieljmarsh on twitter or British Beekeepers page on Facebook if you would like to get in contact. We have reached that time in the year when the majority of apiary tasks are complete and the bees are beginning to reduce their flying hours, except on hot days when you will still find them clustering on the outside of the hive, and our thoughts turn towards the the autumn, mending, cleaning and storing equipment and studying to understand our bees more. 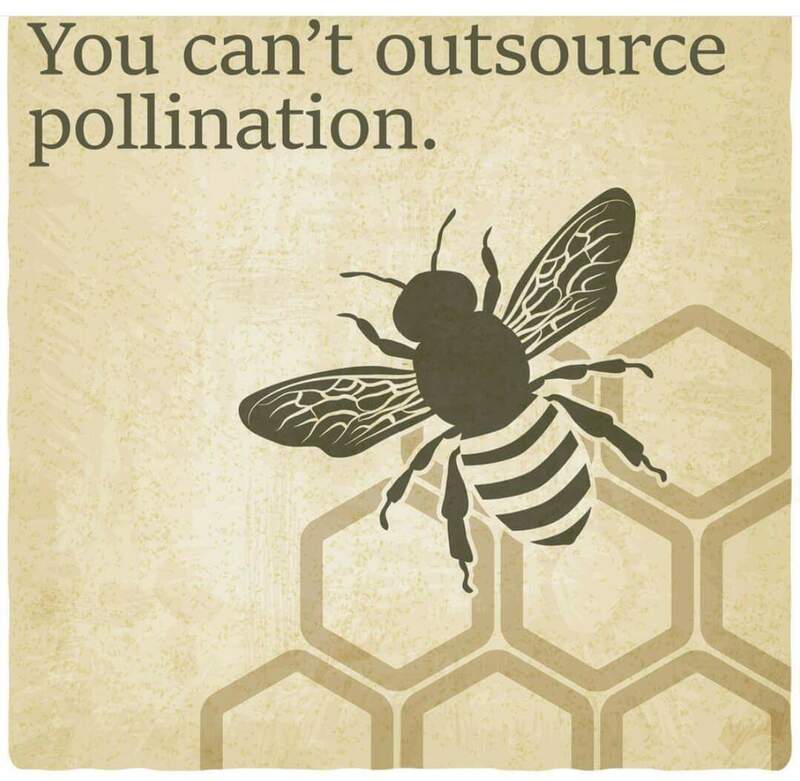 If you don’t normally buy local raw honey consider it, supporting your local beekeepers in turn helps the bees in your area and they pollinate a lot more than your garden flowers! 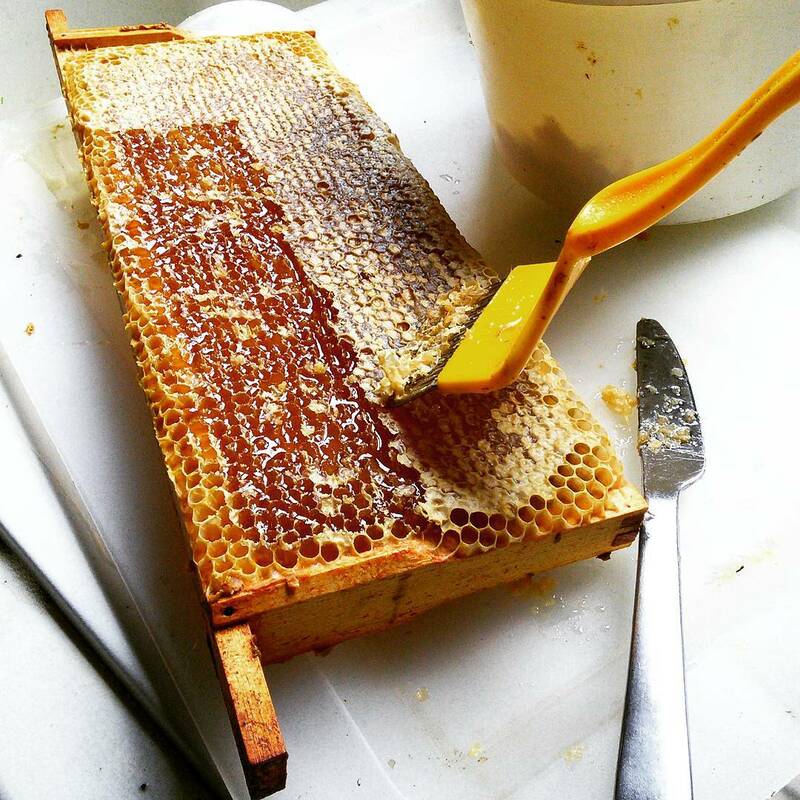 There are lots of health benefits associated with raw honey as well as having a fantastic and unique taste! 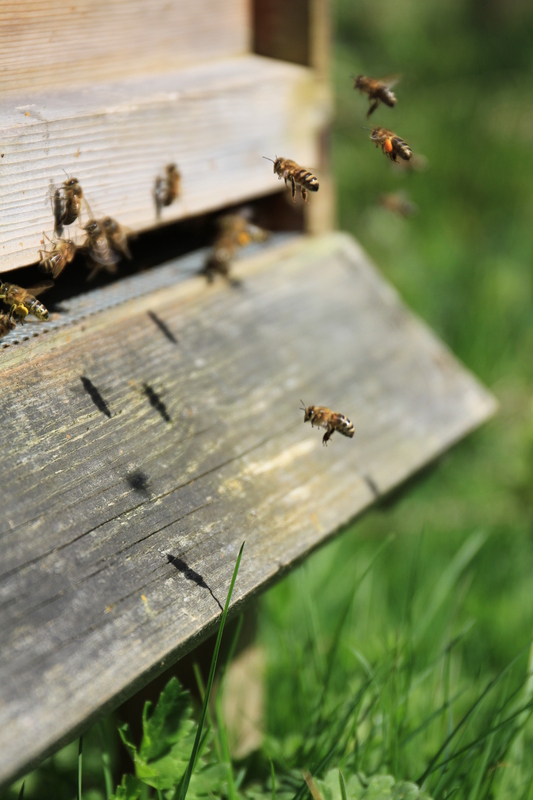 Supporting your local beekeeper will allow them to maintain a number of healthy colonies in your area as well as training the next generation of bee guardians for the future! 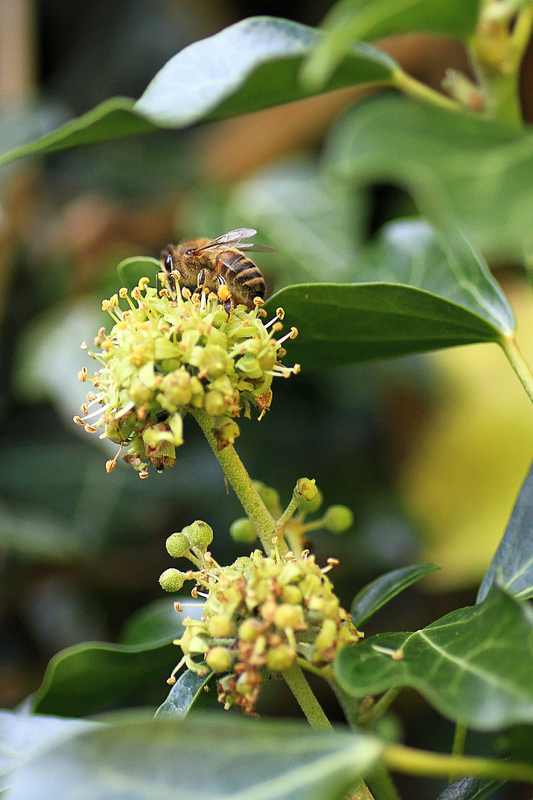 I haven’t been that active with the blog this year but the bees have more than made up for my lack of activity. 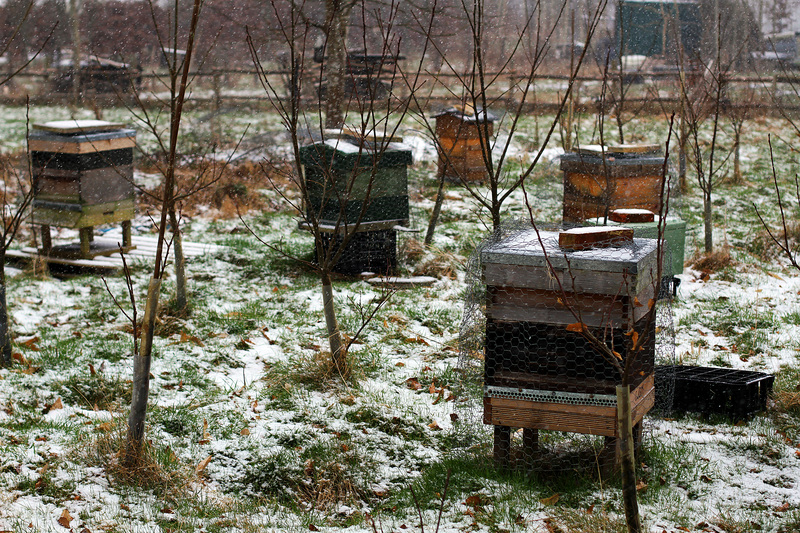 Back in December we took the chainsaws into the woods on the land where the apiary is located and cut a new clearing, then moved the bees during the only short cold spell we experienced and it even snowed on the day of the move which at least kept the girls in the hives! Hopefully this will now be a place that they can stay for the next few years surrounded by flowering trees, wild flower meadows, hedgerows and an RSPB nature reserve which is being returned to heather and gorse. 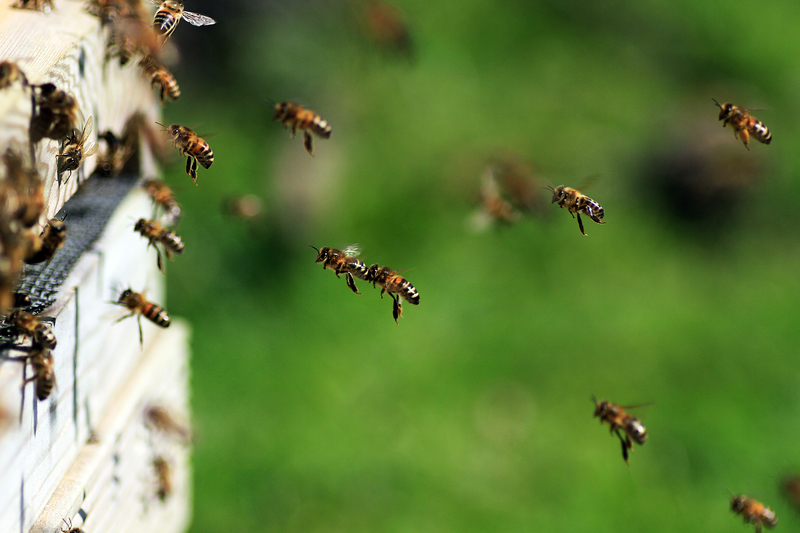 The warm winter didn’t really see an end to the bees flying and being active in the hives. 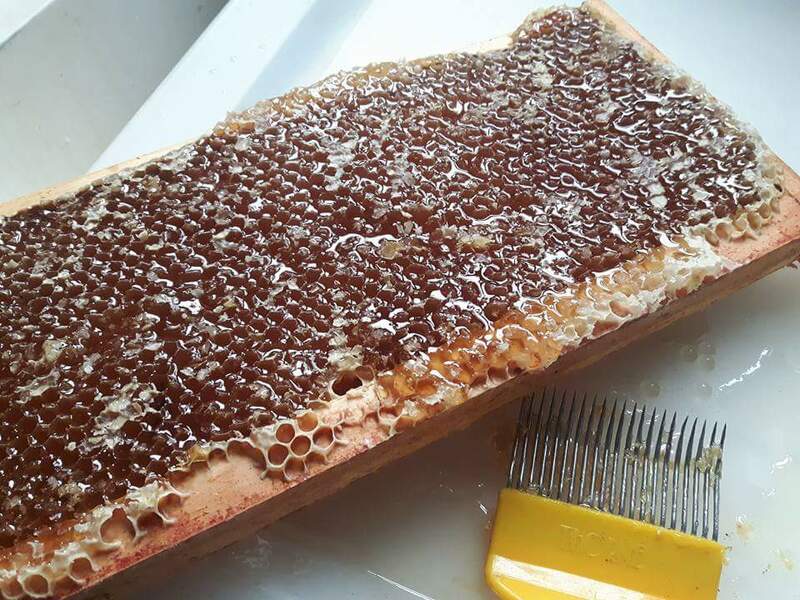 I treated with oxalic acid at the end of December once we had moved the hives then started to feed bee candy which I do every year as a form of insurance. When I checked the hives in February all was fine but at the next check in March I saw that one colony had died from isolation starvation despite having candy sitting on the frames right above them. This is the second time that I have experienced this in 7 years of beekeeping but it still brings great sadness when you open a hive to find it dead inside with the last bees left head first in the cells trying to find food. 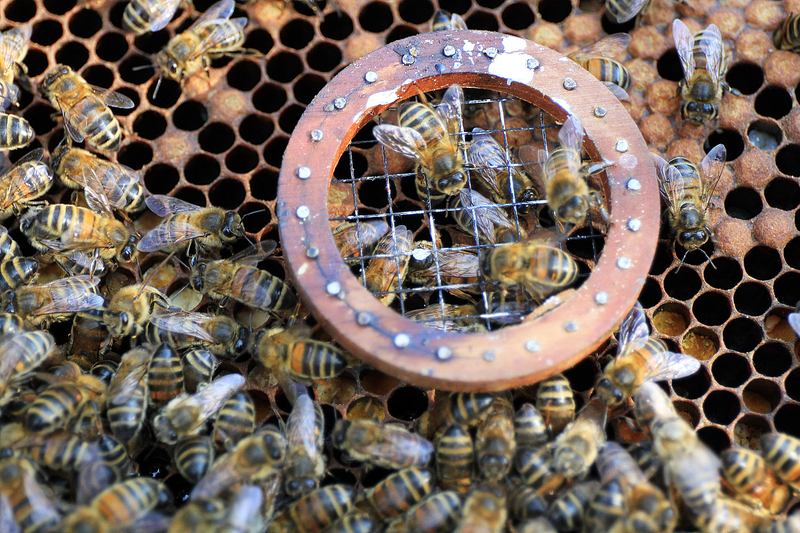 The four remaining colonies expanded fast and two were ready to be artificially swarmed by early May. I carried out the splits easily enough as this is a routine operation in any beekeepers year but subsequent checks saw both swarmed colonies rapidly establish themselves , drawing out new comb only to swarm again leaving new queen cells behind a few weeks later. We then checked on the hives that seem to have passed through May without threat of swarming only to find that they have been busy making preparations in the last few days so once again we quickly split the hives and will wait to see what comes over the next few weeks. I can also be found at @danieljmarsh on twitter or British Beekeepers page on Facebook. Autumn arrives and the girls keep flying…. As I come towards the end of my beekeeping year in October (as far as apiary tasks are concerned anyway) I am surprised just how active the bees still are. A few weeks back the bees were arriving at the hive entrance looking like ghosts, painted white by the pollen from the Himalayan Balsam flowers but now they are bright yellow returning from the ivy which will probably be the last source of pollen for use as food for this years late, and next years early, brood. The final hive inspections have allowed me to check that the bees still have sufficient stores of honey and pollen, that the smaller amount of brood is still healthy from disease and that they are going into winter with young strong queens. Additionally now that the colonies are substantially smaller the queens that managed to elude me over the last few weeks have finally been found and marked and this will help me keep tabs on them come the spring. Its been another busy year and whilst I have seriously neglected the upkeep of my beekeeping blog but I have had yet another fantastic year with the bees, trying to keep one step ahead of their unpredictable antics and occasional escape plans….The summer months were busy with several attempted swarms that were rescued with colony splits, only to find that both halves had later swarmed and re-queened. 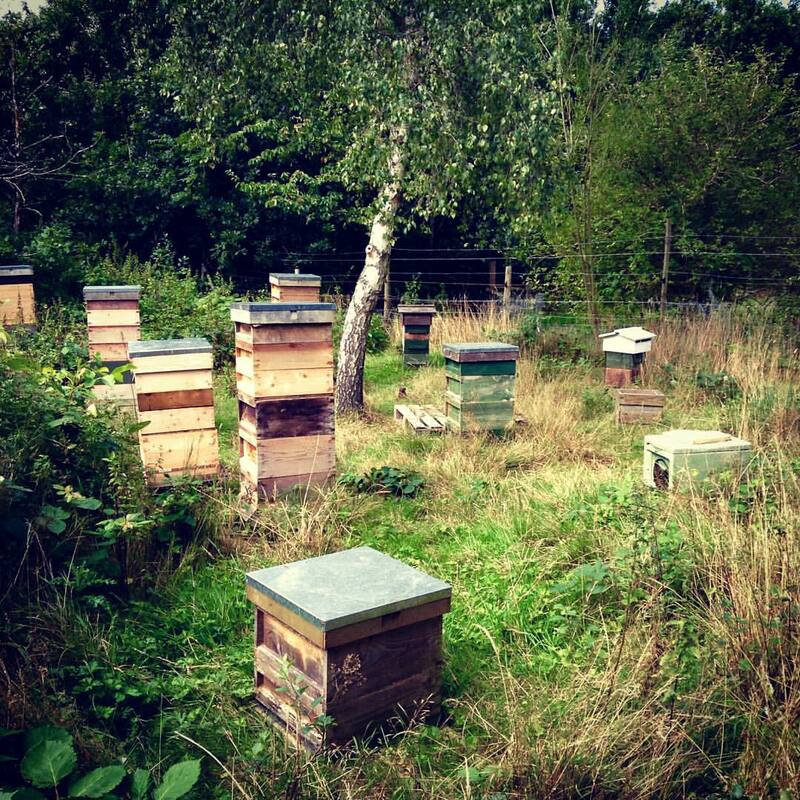 The supers also began to stack up in the apiary as the bees worked relentlessly bringing in nectar from flowering trees and wild flowers in the surrounding woods and meadows. 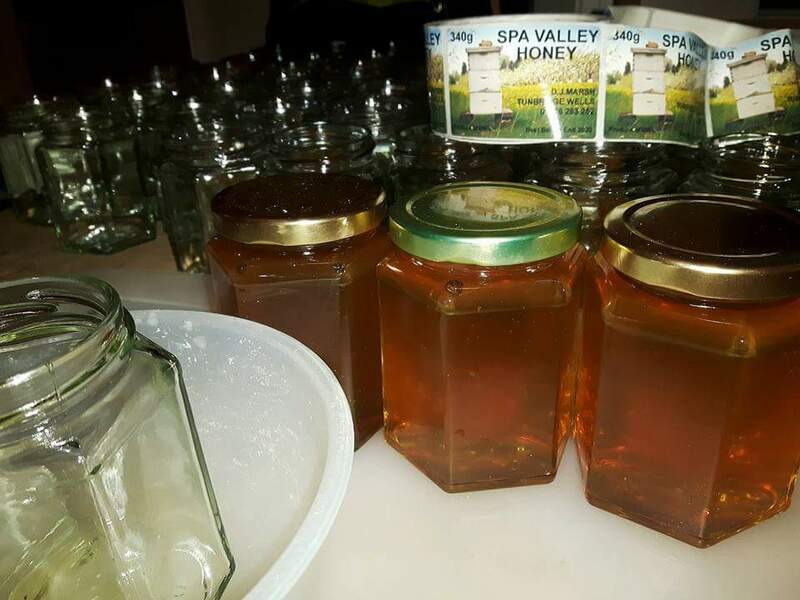 We harvested the honey crop from four of the hives during early August and ended up with approximately 169 lbs of raw honey, which in turn became 225 (12oz) jars of liquid gold. The news reported that 2015 had a record low number of wasps but it certainly didn’t seem that way around the bee hives as we got towards the end of August, maybe we had attracted them in from the rest of the country! The hive entrances were reduced but the wasps continued to rob the hives and it seemed that every time I lifted a roof wasps flew out alongside the bees despite the colonies being very large and strong. 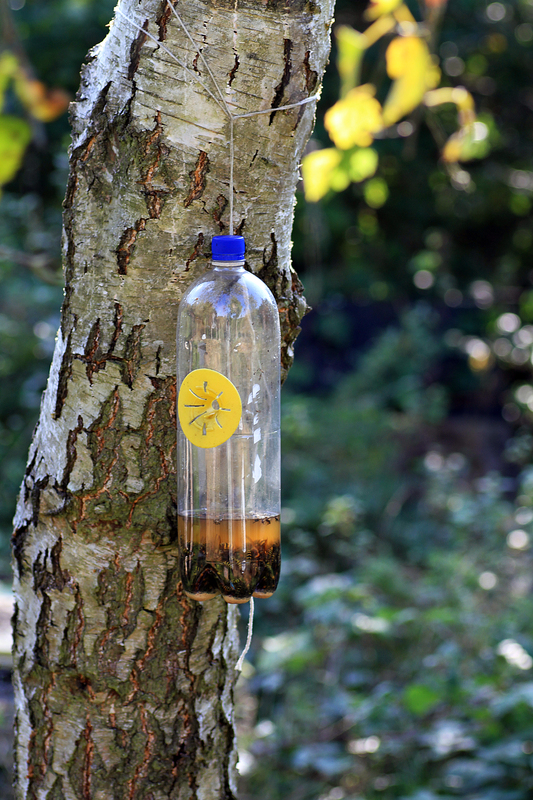 I decided to put up a trap for the first time in seven years and hung a single bottle baited with apple juice, cat meat and wine vinegar from a tree in the centre of the apiary. The Trap didn’t have the instant ‘wasp appeal’ that I had hoped for, I guess it was naive to think that these greedy wasps would give up on the chance of my honey and head off to certain death, however on subsequent inspections I was pleased to not only find out that it had been highly effective but had also pulled in a number of European Hornets which at over an inch long look massive next to the wasps! As the nights have closed in and the temperature has become cooler recently I have put on the mouse guards over the hive entrances to keep any would be visitors out and covered the woodwork with chicken wire. I have spent the last few weeks admiring the beauty of the green woodpeckers in the apiary, and although they have never been a problem here it is a small price to pay for the insurance that they wont turn my hives into kindling and destroy the colonies when the first frosts arrive. Now’s the time to get any equipment cleaned and safely stored away then sit back and plan for next year, read about bee improvement and enjoy some of the fruits of ‘your’ labour…. I will continue to write about my journey with the bees in 2016, thank you for taking the time to read my ramblings and for your continuing comments and questions – this makes it all worth while for me as the writer…. 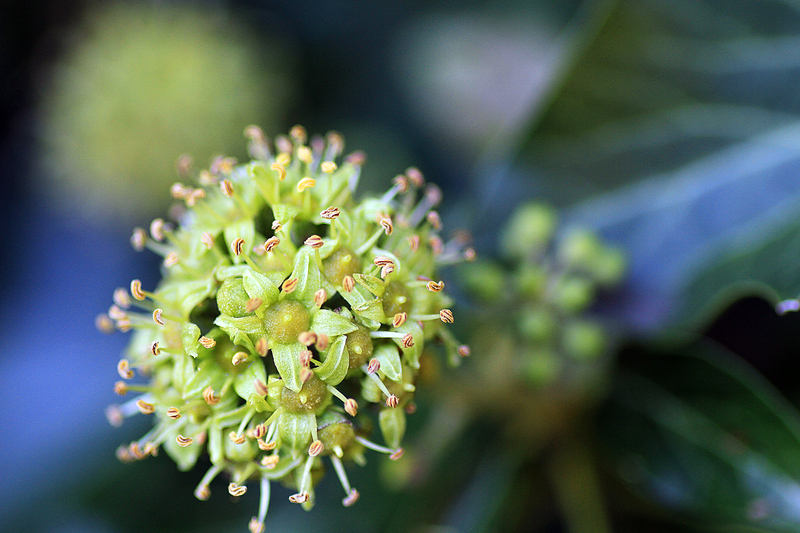 Winter is over and here come the girls…. 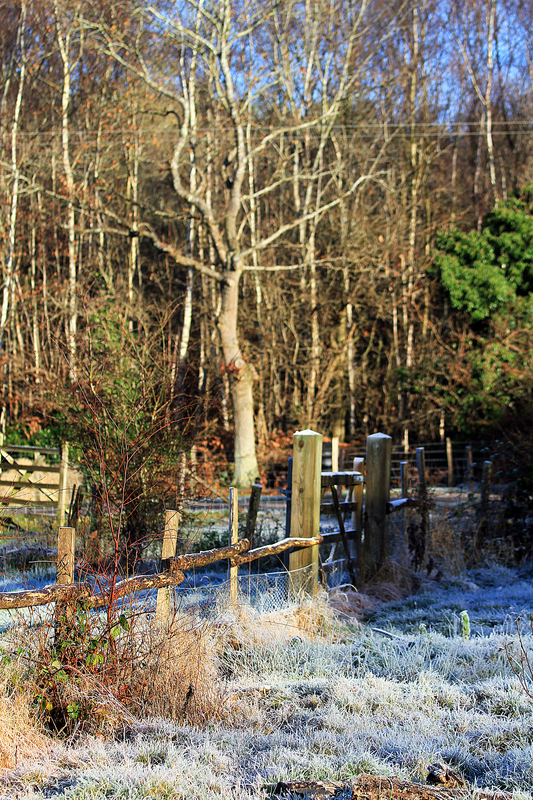 Its been relatively quiet down at the apiary over the winter months with the bees mostly staying in their hives even if they did not cluster for long periods due to the warm weather we experienced again in the south east. I did not feed any syrup in August following the honey removal last year as it was such a good year that the bees were still bringing in pollen and nectar late into the season and I had left a good amount of honey on the hives as this has to be better for them than a sugar substitute! 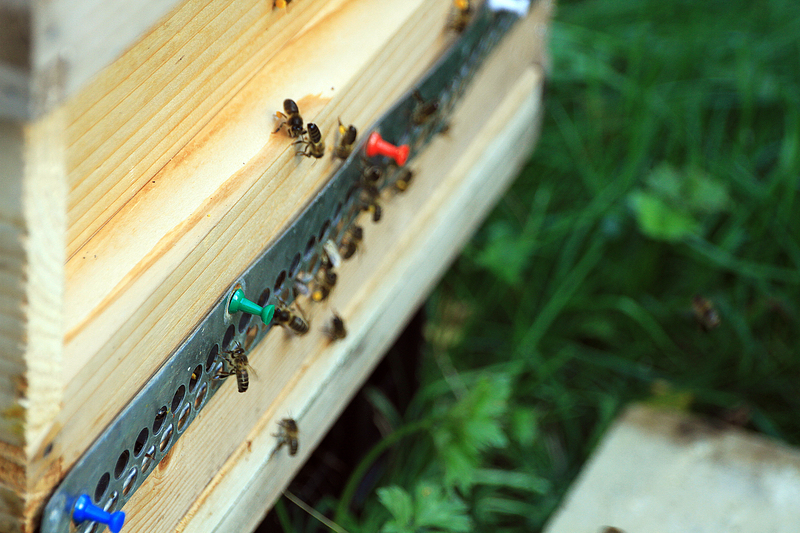 I checked back on the bees around new year when I also applied oxalic acid, dribbled between the frames to help control the mite whilst the colony was without sealed brood, and gave each hive some bee candy above the crown board as an insurance policy against starvation. Its always nice to see the girls doing well at this stage but I am quite aware that this is never a guaranteed sign that they will all make it into spring. The bees were still quite active and a few followed me when I left the apiary which was sad knowing that these would soon chill and fail to find their way back home…. My bee buddy Paul and I also moved the apiary to a new location around new year, it was only a few hundred meters across the land so that the bees will now get more light earlier in the day as they had become overshadowed by the tress rapidly filling the skyline around their old homestead. 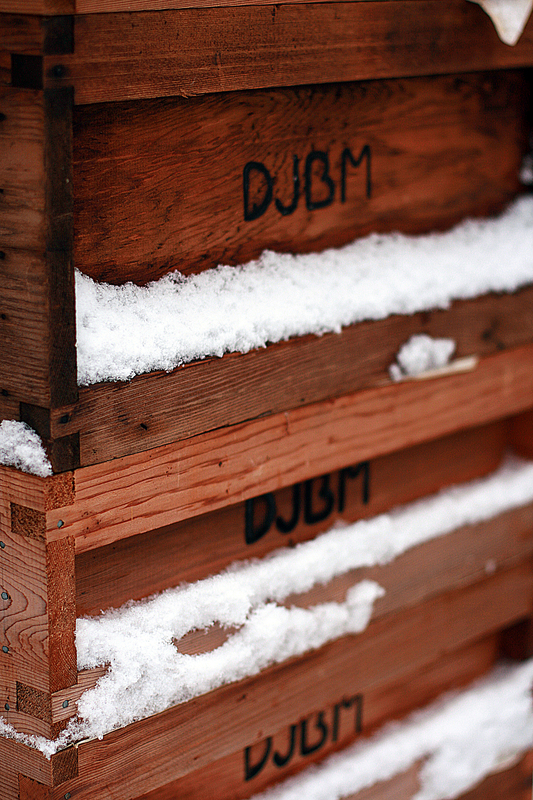 Winter is one of the few times you can move the hives like this, at other times you have to stick to the ‘less than 3 feet or more than 3 miles’ rule to prevent the bees returning to the original hive location and clustering on the ground. We strapped the hives but didn’t block the entrances and wheeled them carefully across the bumpy ground in a wheelbarrow. All the bees behaved and stayed indoors until we got to the final hive with the feisty black British queen (these are my best honey makers) and they came streaming out en-mass and found a hole in Paul’s gloves to let him know about their disapproval, needless to say I ended up moving that one on my own. I returned to lift the roofs and check how the bees were getting on in February and a couple of hives had started to nibble the candy, despite still having some honey in the outside frames, just goes to show that they would rather go up than sideways in their search for supplies. 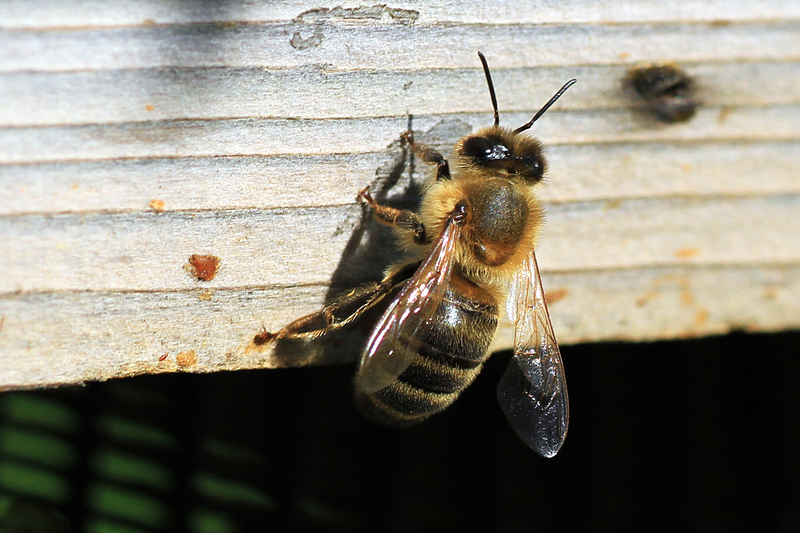 Early April saw a mini heatwave across the UK with above average temperatures and sunshine hours and the bees didn’t waste a minute of it. The bees have been very busy and nearly all the hives had 8 or 9 frames of brood and pollen across the ‘brood and half’ system that I run. With colonies this strong it was definitely time to add the first supers to give the bees more room for stores, prevent hive congestion and maybe delay the inevitable swarming for a couple more weeks whilst I get my backup gear sorted and ready for use. As a beekeeper with a busy life, young family and full time employment I don’t often get the opportunity to simply stand back and watch the bees but I recently took some time to photograph the bees activity at the apiary and just enjoy watching them in flight bringing in the spring pollen, you can learn so much about the strength and health of a colony through observation at the entrance and its far less intrusive to the bees than opening the hive up. I hope to get the time to do this a bit more often in the future…. The weather has become more unsettled, with cooler wet and windy weather across the UK this week and the girls are not flying as much but I have no doubt that they are still just as busy indoors and planning the plot to their own ‘game of thrones’ so now I am just waiting for a break in the rain to try and catch up with them…. As ever I will be adding to this blog as and when time allows and I am not actually elsewhere or with the bees in 2015, thank you for taking the time to read my ramblings and for your continuing comments and questions – this makes it all worth while for me as the writer…. 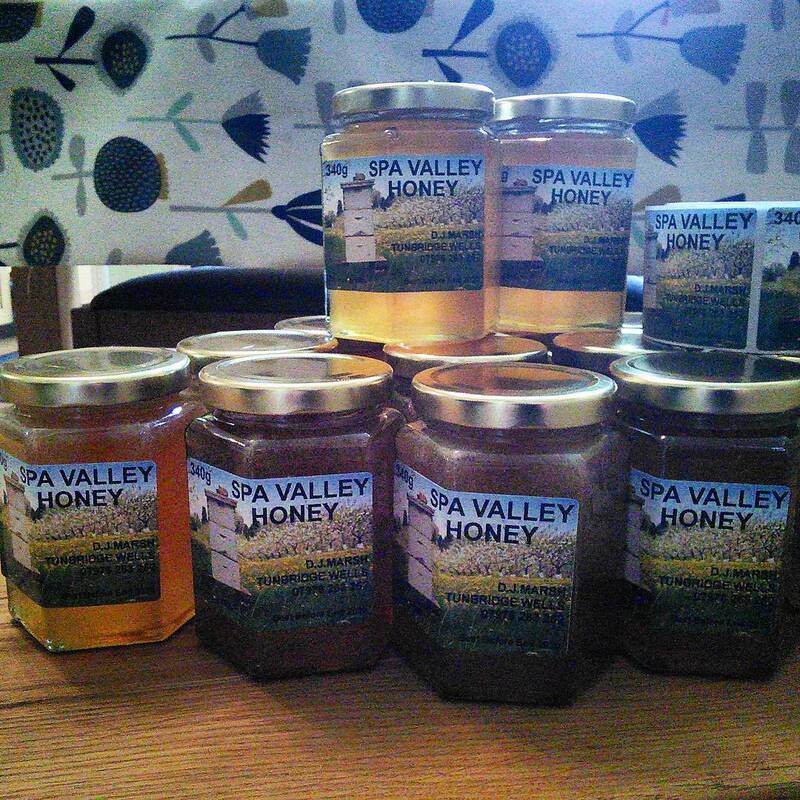 Well its coming to the end of 2014 and its been another fantastic beekeeping season, the apiary has expanded and its been a bumper year as far as honey production goes. 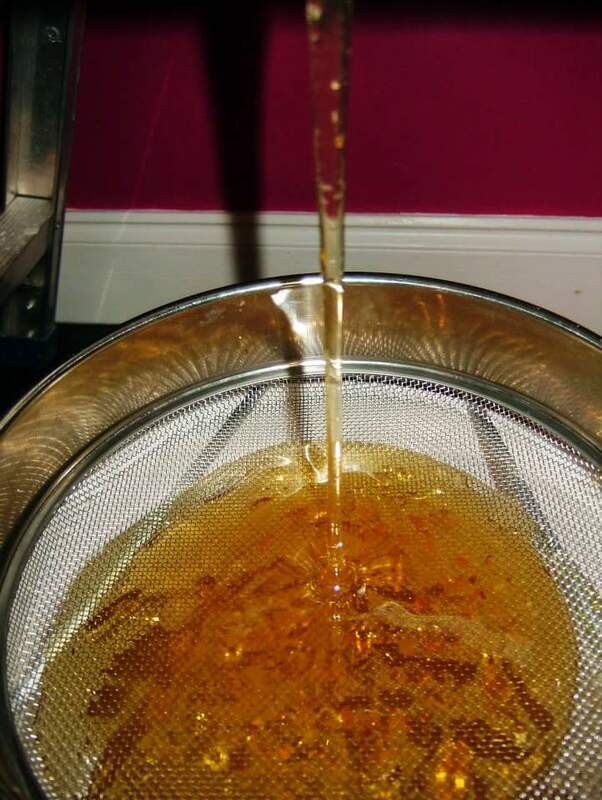 I’ve started experimenting and using more wax for candle making on a hobby scale and am currently cleaning up the propolis that I have collected over the last few years and am hoping to start making some medicinal tinctures with this, possibly blended with echinacea, in 2015. 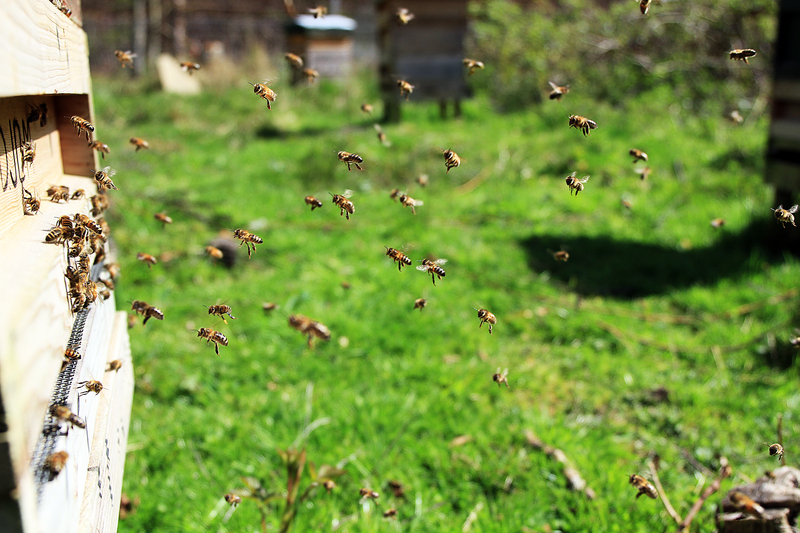 It’s just beginning to to get cold in the south east and hopefully the girls will stop flying soon, we are still waiting to apply our oxalic acid and will be moving the apiary site to a better location in the coming weeks. The blog articles that have generated the most interest over the year continues to be my writing about using bee venom therapy (BVT) for treating rheumatoid arthritis and it has been a real joy to hear the really positive stories of other people who have felt inspired to try this after reading of our success and have themselves made real progress in overcoming this auto-immune disease. I hope that others looking for advice and information on this subject continue to find the blog and realise the the western drug route for controlling the pain is not the only option open to them. 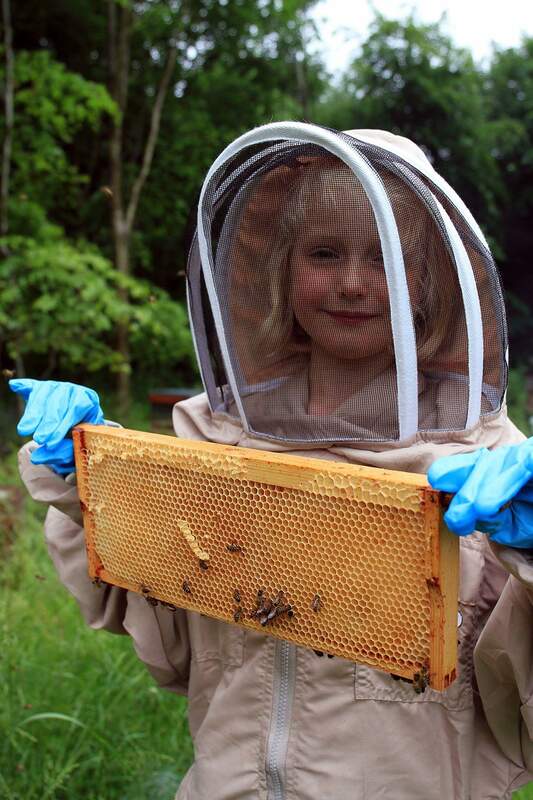 Another highlight of my beekeeping year was my wife finally joining me at the hives now the children are slightly older and can entertain themselves whilst we attend the queen and her workers. 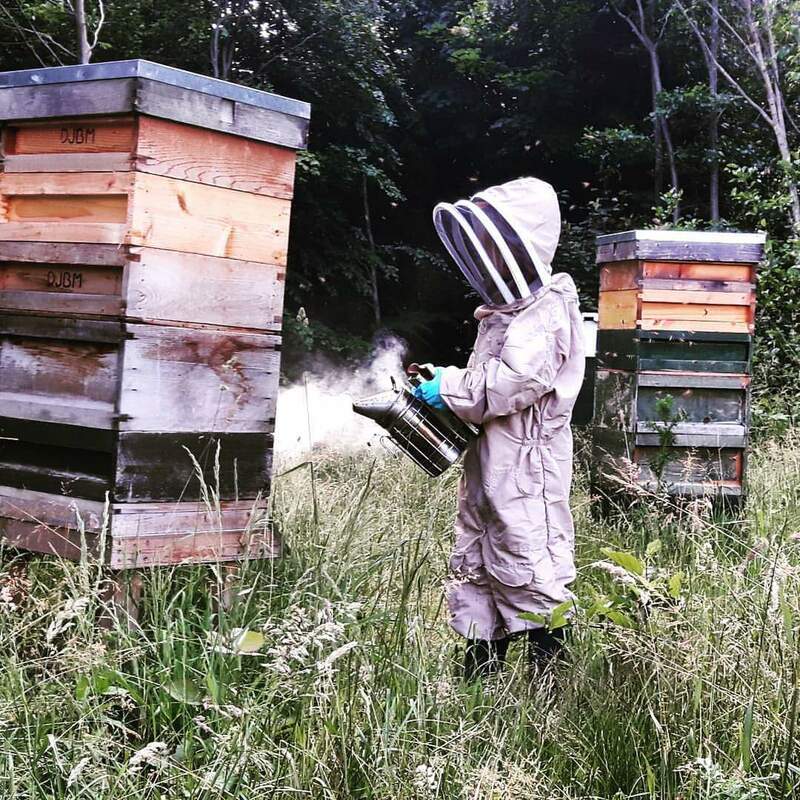 I think that she was amazed at just how spiritual and humbling the whole experience is of opening up the hives, watching and listening to the bees communicating and absorbing all the associated scents of honey, wax and propolis. I’m looking forward to more joint visits in the sunshine as the 2015 season rolls out. Thank you to everyone who has taken the time to read my blog this year, there have been over 37, 000 visits at the time of writing this article. Please keep the comments, questions and feedback coming as it is always nice to hear from fellow keepers, wherever you are based in the world. I wish you all a very Happy Christmas and New Year, keep an eye on your bees over the winter months and remember to give emergency feed if required and check the hives if we get a repeat of last years storms or any heavy snow. I was recently contacted by a US based company who had read some of the blog where I talk about our experience of using BVT to ask me if I would share their infographic detailing the effects of anaphylaxis on the body. This is an interactive chart allowing the reader to pick the side effect they want to learn more about. You may have a food intolerance or a minor allergic reaction to something you come into contact with, but that pales in comparison to anaphylaxis. Almost any substance can be an allergen, including foods and insect bites or stings. The cause can’t always be pinpointed. The first time you’re exposed to the substance, your immune system learns to recognize the foreign invader. In anaphylaxis, when you’re exposed again, your immune system has an exaggerated response that affects the whole body and may put your life in danger. Symptoms may begin within seconds and they can progress swiftly. The first line of treatment is usually adrenaline, because it can turn things around quickly. Once you’ve experienced anaphylaxis, you’re always at risk, so you should take great caution to avoid the triggering substance. Your doctor will probably prescribe adrenaline in the form of a prefilled autoinjector that you can carry with you. If you need to use the autoinjector pen, you can inject yourself or have someone else do it for you. You should always seek medical help after using adrenaline. Symptoms sometimes return, but usually within a 72-hour period. Your immune system fights antigens like bacteria, viruses, and fungi. It learns to recognize these harmful substances and works to neutralize them. Once your immune system has come into contact with an antigen, it stores the information for future use. When it’s doing its job, you don’t get sick. Sometimes, when you come into contact with that antigen again, your immune system overreacts, blowing the event out of proportion. Far too much histamine and other inflammatory chemicals are quickly released into your system. This causes a wide variety of problems that can have devastating results. Adrenaline is a hormone produced naturally by your body. In anaphylaxis, an extra dose can help increase blood flow throughout your body and help reverse the immune system’s aggressive response. Inflammation in the respiratory system can cause the bronchial tissues to swell. Symptoms include shortness of breath and difficulty breathing. It can also cause fluid in the lungs (pulmonary edema) and cough. You may make high-pitched or wheezing sounds when you breathe. A feeling of tightening in the chest and chest pain are common. Respiratory distress is a life-threatening emergency requiring immediate medical attention. Untreated, it can lead to respiratory arrest. Patients with asthma are at particular risk. One of the more obvious signs of anaphylaxis can be seen on the skin. It may start out as itchiness and redness, or just a mild warming of the skin. 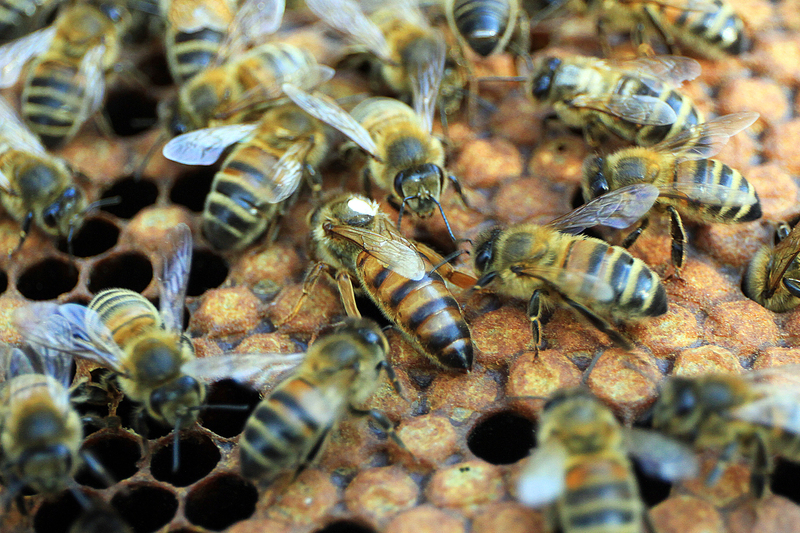 It can progress to welts, or hives that hurt when you touch them. If your respiratory system is in trouble, skin may turn blue from lack of oxygen. Pale skin means you’re going into shock. In anaphylaxis, small blood vessels (capillaries) begin to leak blood into your tissues. This can cause a sudden and dramatic drop in blood pressure. Other symptoms include rapid or weak pulse and heart palpitations. When major organs don’t get the blood and oxygen they need to perform, your body goes into anaphylactic shock. This is a life-threatening medical emergency. Untreated, you are at great risk of damage to internal organs or cardiac arrest. Even if your reaction is usually mild, food allergies put you at increased risk of developing anaphylaxis. Digestive system symptoms include bloating, cramps, and abdominal pain. You may also have nausea, vomiting, or diarrhea. Even before the first physical symptoms occur, some people have a weird feeling – a sense that something bad is about to happen. Others describe a metallic taste in their mouth. Inflammation in the central nervous system can make you lightheaded or dizzy. Some people get a headache. There may be swelling of the eyes. The lips and tongue can swell enough to make it hard to talk. If the throat swells, it can block your airway. Anaphylaxis can cause mental confusion, anxiety, and weakness. Other symptoms include slurred speech, hoarse voice, and difficulty talking. 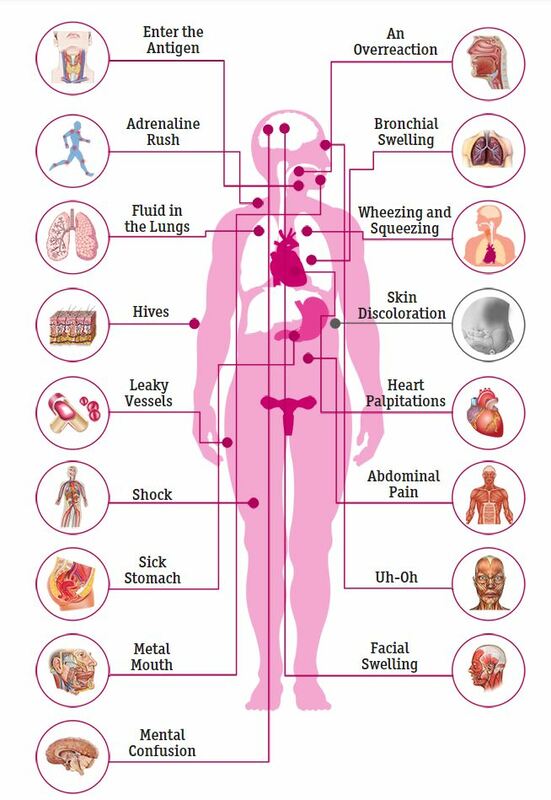 As your body goes into shock, loss of consciousness occurs. Bee venom must always be treated with the utmost respect, even if you are a seasoned keeper who has been stung on multiple occasions. 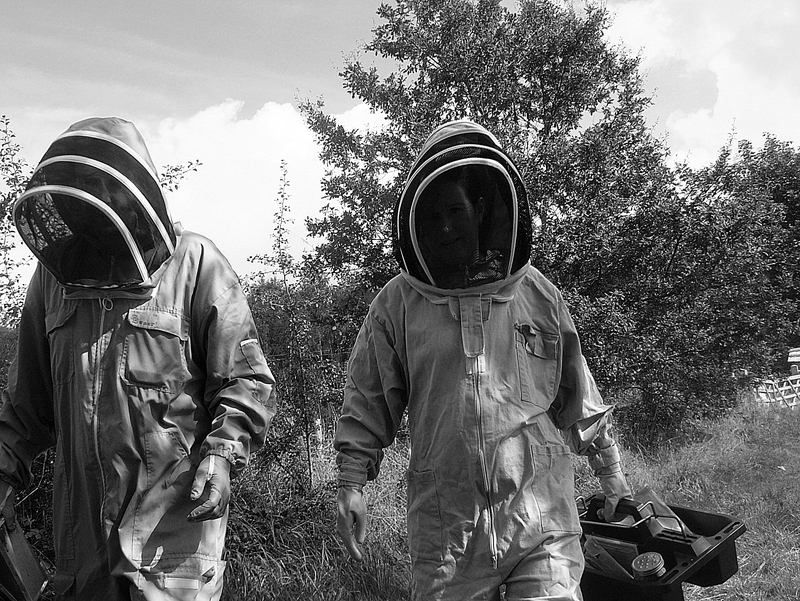 Always make sure that you let someone else know that you are going to visit your bees and where they are, the time you expect to return, carry a mobile phone and any medication that you may require. If in any doubt following a sting alert the emergency services and wait for collection, the last thing they want is you causing a RTA when you pass out behind the wheel on the way to hospital! I hope to keep adding to this blog as and when time allows in 2014, thank you for taking the time to read my ramblings your continuing comments and questions – this makes it all worth while for me as the writer…. 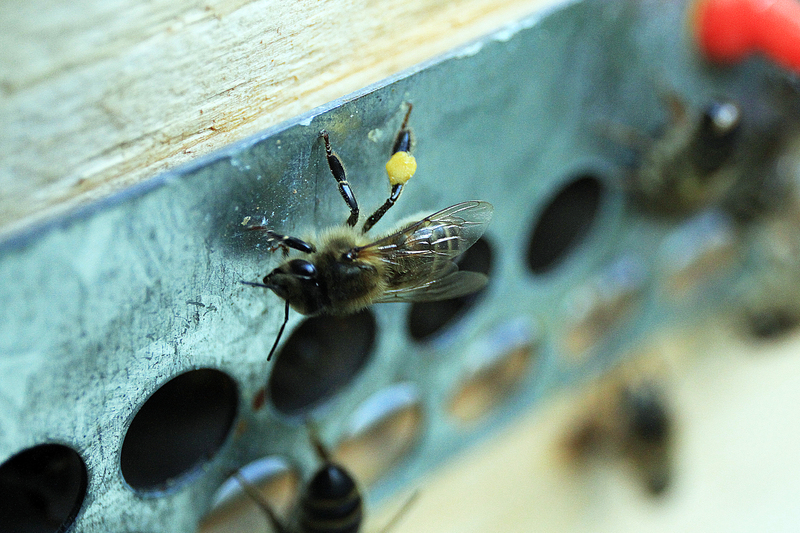 August arrives with lost queens and egg laying workers - is this the end of my colonies? 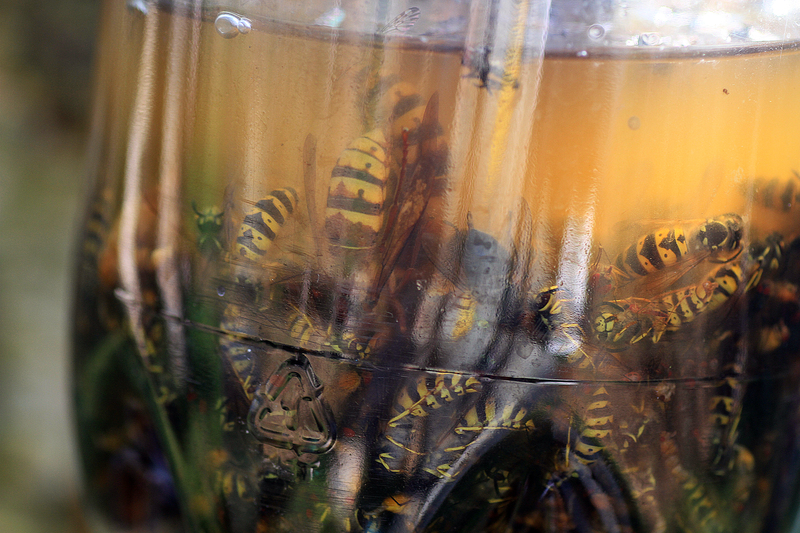 Bee Venom Therapy in action - does it really cure the pain?